Yes, you have read it right: this soup is made with sauerkraut as a main ingredient. As far as I can tell, it is of Slavic countries or Central Europe origin and there is no need to say that it is a comfort food. 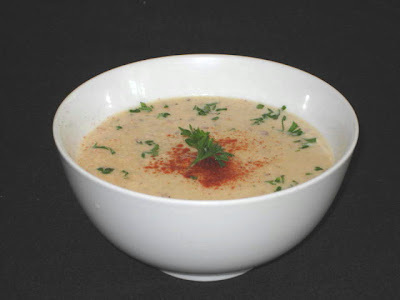 My version is more robust then simple soups that use just sauerkraut, potatoes and stock. Again, just use your imagination like I did. I think that the key in making this soup taste great to unaccustomed taste buds is to soak, wash and drain the kraut in cold water. I dumped the whole jar of sauerkraut into large and deep bowl, filled with cold water and let sit for an hour. Then I drained it in strainer and washed it under running water for half a minute. I let it drain and run it in my lettuce spinner to remove as much water as possible. This was important step for me because I like to chop the long strands of sauerkraut into a size that will stay on the spoon and not hang over like spaghetti. 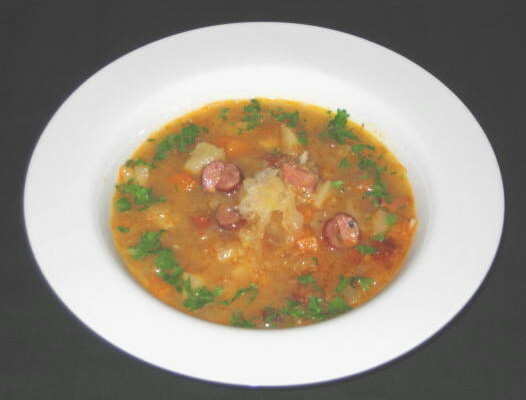 My soup was fortified with addition of carrots, onions, celery, potatoes, garlic and smoked kielbasa. For the base you can use any stock you have on hand. Ham stock would be ideal but I didn’t have any. Next time I’ll cook smoked Schweinshaxe or Eisbein (pork hock) I will keep this recipe in mind and keep some meat and skin (for me only) for the soup. Soak the sauerkraut in cold water for about 1 hour. Drain, squeeze dry and roughly chop. Crush caraway seeds with garlic in mortar, mini-chopper or chop with knife. Mix 1/3 cup water with chopped bacon and place in a heavy bottomed soup pot or Dutch oven. Turn the heat on medium high and render the bacon fat. When bacon starts to get crispy and light brown add onions and garlic-caraway seed mixture and cook until onions start to have light color. Off the heat mix in paprika and stir till onions are coated. Put back on heat and add carrots, parsnip, celery, potatoes and smoked meat or sausage. Mix for few seconds and then pour in stock. Bring to boil, cover and simmer for 15 minutes. Add sauerkraut and simmer for another 15 minutes. Soup is ready to be served as is but if you like soups with more body, run about half of the soup in blender, return to pot to reheat and serve. Another option is to liquefy the leftover soup in the blender, add some 35% cream and simmer for few minutes. Sinfully good! It is rather surprising how good that soup was. I was never very found of sauerkrout but this soup made me say:"encore". The Official taster of the house.